To help clear things up, we will look at what has been shown versus what is the reality in the following areas: perceptions, mannerisms, activities, beliefs, hoarding vs. being stocked, and outlook. Our perceptions of how these people actually live have been heavily scripted to paint a very specific picture. One of these shows was filmed on the island I live on. It is the one with Alaska Ink featured. They create supply caches and toss them in the ocean for storage. Generally speaking, the ‘events’ people are prepping for are ones assigned to the group to try and meet. The people in the shows are kept up for long hours, on purpose, to create drama and strife. The production crew is told to instigate strong emotions and outbursts for better television. “Accidents” are staged on purpose to, again, create more drama. In fact, if you listen closely to many of these types of shows, you will hear what people are saying was not said in one sentence! The sentence will start off in one tone but end in another tone. It is common for these types of ‘reality shows’ to take words from one statement and string them with another statement to create whatever is needed to be said to enhance the drama. The reality is that these people aren’t doing things much differently than their grandparents or great grandparents did: they are preparing for unforeseen events. Back then it was not called ‘prepping,’ it was called ‘life.’ Back then, there wasn’t a grocery store on every corner (not that they had the money to run to the store anyway) and life was not as disposable as it is today. Mentally unstable people make for excellent television, don’t they? Keep ‘em awake for 20 out of 24 hours and things get really fun! While everyone has eccentricities that help make us unique, even the most normal of quirks is made to be something really ‘out there’ in the editing room. These shows would have you believe that all preppers are paranoid, food hoarding, anti-authority gunslingers. Or just completely out of their minds. The reality is the majority of preppers are normal people, just like anyone else is ‘normal.’ In this day and age of labels, there isn’t a person on the planet that some psychologist couldn’t find one label or another to pin on all of us. That being said, if you look beyond the scripting and presentation of the show, you will see that these preppers are people who would rather rely on themselves versus the government and plan for the future. They consider things weeks, months, and years down the road. They are working to provide for themselves versus waiting in line on the government steps with hand stretched out and think they are entitled to whatever is being given out. Preppers are producers, not merely consumers. When most people think of preppers, thanks in large part to Hollywood, they think of people with year’s worth of food in bunkers and thousands of rounds of ammo. They believe that preppers spend all their time and money on preparing for disasters and situations that ‘are not likely to happen anytime soon.’ Preppers are portrayed to be almost zealous or fanatical about their activities. While there is assuredly passion about what they are doing, the reality is that the average prepper is one of the most down-to-earth and logical people you will meet. They reuse, recycle, upcycle and generally try to make things work with what they have on hand versus going out and buying something that they could either do without or make themselves. Yes, sometimes you just need to buy something new as an investment, but overall, they live very practical lives. The biggest difference I usually see through talking with people and reading other blogger’s posts is that they go about these purchases in ways that will avoid debt. It is considered absolutely normal in today’s society to be tens or even hundreds of thousands of dollars in debt. To take on the ideal of living 100% debt free is foreign to most Americans. Your credit score actually goes down if you do not have a good mix of credit cards, mortgage loan(s), and car loan(s). I worked in a bank for 7 years and have always watched my score closely. I noticed that one of the factors that lowered my credit score was due to the fact that I do not have a mortgage loan. I called Experian and asked about it. I was told that if I had a mortgage, even if it had late payments, my credit score would go up 25-40 points!! WHAT?! No wonder people who live debt free are judged or looked at as weird! This is a big one. 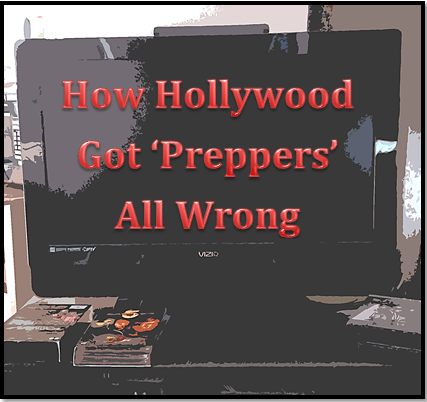 Hollywood has painted a picture of ‘preppers’ as though the entire group of 3 million, at last count, believe a huge catastrophic event will happen in their lifetime. In many ways, the prepping community as a whole has been cast in a cult-like light. I have seen posts from certain prepping and survivalist sites that incite fear and try to whip people up into a frenzy, thinking they need to go out and buy all this stuff to be able to survive whatever threat may come their way. This is the same type of tactics used on some television shows. This could not be further from the truth. The reality is that preppers come in all shapes, sizes, beliefs, and cultures, and are as diverse as any other group of people under the microscope. There are extremists in any group out there. The trouble is the media primarily focuses on those type of people for the ratings and drama. How good would a show be that only depicts normal, everyday people who have large gardens as a food source and a means to provide for themselves and save money? What about the family who uses camping and hiking as a way to teach the children skills that will help them survive if needed? It is too normal and would be pretty boring for the general public who thrives on turmoil, strife, and watching shows that make them feel normal compared to ‘those whack jobs’ on television. This is one of my favorite myths to break whenever the topic of “Doomsday Preppers” comes up. We have all seen the people with bunkers and pantries absolutely stocked to the roof with years worth of food. There is that episode, too, where one lady takes a door apart and stores boxes of macaroni and cheese inside it. Really? That is, without a doubt, 100% extremist and absolutely not the normal behavior of one who calls themselves prepper. If you were to walk into my house, you may see my stack of mylar bags with beans, rice, and barley in them. Does this mean I am hoarding 50 pounds of each? No way! But I do have enough to get us through hard times such as a job loss, a break in the supply chain, or some other event that would leave us unable to shop for more food. One thing I would like to specifically point out here for perspective is that the first grocery stores as we know them have only been around for the last 70 years or so. Before that, there may have been trading posts and whatnot but absolutely nothing like what we are used to today. Most people had their own gardens and livestock for their food source. They would hunt and fish and trade. As the idea of a self-serve supermarket gained popularity, you still saw people buying in bulk and setting some back ‘just in case.’ Growing up, my grandmother always had some kind of pantry in a ‘cool room’ that was usually in the back of the house in constant shade. When things would go on sale, say corn for example, she would buy a whole case at a time. When I asked her about it in my adult life, she said when she was a child the shelves were stocked with jars instead of cans but she liked having the convenience of someone else doing all the processing. That idea became the normal way of doing things! Let someone else process it. Big food companies were born and now it is to the point where they have so much control over what we eat, and where we get it from, that people are getting arrested for buying raw milk or raw vegetables from their neighbor, and heaven forbid they have a garden in their front yard. The scandal! What we are seeing, I believe, is a shift back to our great-grandparents’ way of living. I can hope. This is where I get the chance to set some things straight. If you love what you are doing, how can it be a waste of your life? How can learning to grow your own food or make a shelter or learn different ways to start a fire be a waste? I do not feel like anything I do to increase my self-sufficiency is a waste of anything. There are so many rewards that have come from switching over lifestyles that I never thought of and when they show up, it is like a little surprise party. Examples are the pride I had this past April when I pulled out the last jars of green beans and carrots that I had grown from seed the year before. We did not buy a single can/jar of pickles, carrots, or onions. I know exactly how they were all grown and processed! That was including the jars I had given out to my mother in law and presents of the jams and jellies at Christmas to friends. Homesteaders and preppers are some of the most optimistic, realistic, and generous folk you will ever meet. Generally speaking, they love to share knowledge and forge bonds to strengthen the system around them. They realize they are part of something much larger and have a genuine desire to want to help make things better. They also understand and accept that not everyone thinks the way they do and there are those who will never take steps to secure even 3 days of emergency food and water for themselves. Most really wish their neighbors would wake up and get on board. Preppers have gotten a really bad reputation and I believe strongly that it is directly because of shows like “Doomsday Preppers” that seek to show folk like myself as being completely whacked, out of touch, and extremist. The saddest part about it is that the word itself is now tainted and those of us in the preparedness/homesteading community pause before referring to ourselves as such. I personally call myself a modern homesteader but the reality is there is a very fine, blurred line between that and prepping. Both seek to be self-reliant. Both prefer to have more control over their lives than the average person does. That does not mean they are anti-government, anti-authority, and anti-country. They want to be free to live their life and eat the food they prefer. They want to be able to defend their homes and families without worry that the government will step in and make them the criminal for it. In fact, if you look at history, it is those very ideals and desires for freedom that founded our country in the first place. These are the personal opinions and viewpoints of LeAnn inAK and do not necessarily reflect those of the site admins or owner. I watch the show and I think they’re only able to attract a the dimmest and most extreme. I don’t want just anybody to be aware of what level of preparations we’ve made, let alone a nation of strangers. But, like you, we grew up with it. It’s being thrifty, resourceful. When you’ve gone through seasons where snow and ice have cut out your power for a week or regular annual flood waters has kept you from leaving home for a month, you learn to have blankets, kerosene lamps, wood stoves, and three months worth of food in the house. We learned it from our parents, who learned it from theirs. IMHO, “doomsday preppers” that have specific fears that they over prep for are the extremists of our group. Our group being those that are aware of their environment’s limitations and adjust our habits according to it. This is a great article. It hits near to something that has bothered me ever since “Doomsday Preppers” first aired. However, since the concept of preparedness has always been a part of my life, I have tried to get anyone that would listen to commit some resources for when times get rough. Doomsday Preppers really screwed that up for me. Suddenly, I couldn’t even talk to someone about ham radio without them thinking I was “one of those people”. I wish we (people that prepare for a crisis) had some better definitions to describe what level of preparedness we live at. For example, someone that I would call a survivalist would tell me that I am putting my life in danger to intentionally live in the suburbs and not have any weapons besides a pistol and some hunting guns, and reckless because I don’t grow food, practice OPSEC, or have a functioning bug-out location. On the other hand, some people that know me think I’m going to extremes because I have a natural gas whole-house generator, 6 months of canned food, stored water, solar power, a month or so of cash, and 50 acres of “useless raw land” out in the boonies. So who am I? Am I smart for preparing to a certain degree and saying that’s enough, or am I am idiot for preparing to a certain degree and saying that’s enough? It was a lot easier to get people to listen to the wisdom of preparedness before the show Doomsday Preppers. Thanks, Hollywood, for making us all look like morons. Very interesting article. I’ve always watched the show but most of the time I would never have the money to this. My husband says if he had that kind of money he would do it that way in a heartbeat. I’m a slow prepper, because of the financial restrictions. I will continue to go like the turtle. Slow and easy. You and your website is realistic and information I can use. I am acquainted with someone who was on the show the first season and she was appalled at what was done to her perspective about prepping. Said they take the most sensational ideas and blow them up. And she almost didn’t sign the contract because of some points. She had them change some things before she would. Said she wouldn’t have anything to do with them again and recommended that regular sane people do the same. I’ve only ever seen one episode of “Doomsday Preppers”, but I was amused by it more than anything. I have to agree that they’ve done more harm than good, but no one would watch it if it was a show about Gayla using a woodstove when the power’s out or how Janet utilizes all the hidden storage space in her home. Since FEMA’s gotten on the bandwagon, you’d think that more people would take emergency preps seriously, but they don’t. I recently had to send a young co-worker to my car to get some duct tape, and when he came back he said “OMG; you’re one of those preppers! !” He’s someone I trust, so I used that moment to explain how I used to drive into the mountains to get to work, how my kids and I were briefly homeless, and how we had to get out of our old house in a hurry. I had enough supplies in my trunk to provide food, water, fire, and shelter for several days because there have been times in my life when I had nothing else. He didn’t run out and buy an emergency kit for himself, but it did make him stop and think a bit. He knows me as the calm, steady sort who always has whatever someone needs — whether it’s OTC meds or a spare shoestring — so he’s also changing his opinion of “preppers” in general. We’re just people who have been there/done that and don’t want to be caught off guard. I watched the series. I thoroughly enjoyed it. I, being of normal intelligence, realize that all those shows do creative editing and you have to watch them with a grain of salt. My take on the show with Janet was exactly what she said. If you live in a small space you have to get creative about where you store things. Anything, whether it’s food or kids toys. Doesn’t matter. It was simply pointing out that most people don’t realize how much space they actually have. It’s not really a matter of weird/normal – keep in mind the reason credit scores exist. The purpose of a credit score is to give a company that you want to borrow money from a quick and easy way to evaluate their risk of not being paid back. A mortgage is an extremely useful bellwether of how well you manage your money, because it’s a payment that’s the same every month, it’s generally pretty large relative to your income, it’s long-term, and it’s a major problem for you if you don’t pay it. If you don’t have a mortgage, there’s a lot more uncertainty for a lender – it’s not so much that you’re a *bad* credit risk, it’s that you’re an *unknown* credit risk. If you have a mortgage, a potential lender can see a long-term record of how well you handle paying your debts. A few late payments aren’t a problem – in truth, they’d rather have you pay them late, because they get more interest, and the late payment fee more than covers the cost of sending out a letter that says “Have you forgotten something?” What they don’t want to do is lend you a lot of money and have you not pay them back at all – and if you don’t have a mortgage (or other payments like it), they have no idea whether or not you’ll pay them back. Thanks for sharing and clarifying your side of the story. It puts the reasons for what you did into perspective. It also reminds us to be aware of the whole story before passing judgement. I remember that episode and thought, non-preppers would NOT understand why half of my walk-in master bedroom closet has shelves for toiletries, medicines, and extra food. Sad that, as preppers, we can’t accommodate each others needs and limitations. I too have watched the show knowing that there has been “creative”(questionably) editing. However I would like to know when did preparing for emergencies become weird or out there? And why now all of a sudden is FEMA touting being prepared, you didn’t hear that 3-4 years ago? What’s going on that we don’t know about? sSrry I must be getting cynical in my old age. When I was little my dad lost his job and he (and mom) took whatever odd jobs around the neighborhood they could get. Dad repaired cars, electronics, etc and got a part time job at a local dept store, mom did hair(she had been a cosmetologist before marrying) We were the “welfare” family on the block, we were on the ” Army dole” as pop would tell us when we asked about the “funny” butter and things he’d bring home. IF it hadn’t been for the food mom and grandma put up each year we would have been very hungry. I don’t tell anyone what I’ve been doing. My hubby built me a storage area and when I was showing it to his family, one of his brothers said “Jeez are you one of those survivalist nuts or something?” I told him that I was going to retire in a few years and since (as we all know) prices will continue to rise, I just wanted to stock up on some stuff and save the retirement budget. His other brother said That’s a great idea, I suspect that he is now “stocking” up on things too as he barely made it through his last lay off. Well, more than that, Kathy, since when did living by the seat of your pants, paycheck to paycheck become admirable?? I was one of the people profiled on that awful show. We were the family with the bees and the great community. Don’t believe much of what you saw. The producers tried really hard to make us look crazy. I was promised a book mention and it never happened, I think to punish us for refusing to lie and pretend to be other than what we are. I wrote just in case: how to be self sufficient when the unexpected happens. I am not crazy but I sure felt like it after three days of filming. I clearly state in the article several times that hollywood specifically goes out of their way to paint the picture. You were painted as an over-the-top extremist. Whether or not I feel you are has been assumed. Your situation is and was unique and it is extreme to go to those lengths. Because of your situation, it makes perfect sense however, I clearly state in the beginning part of the article, “Our perceptions of how these people actually live have been heavily scripted to paint a very specific picture.” So I am sorry you were offended but no matter how you paint it, putting food into a door is over the top. It works for you and that is good but it is not the normal behavior of the average prepper and that is simply the point I was making. credit and mortgages has been mentioned here. Anyone looking to improve their score, for whatever reason….I just got a secured credit card and my score went up 35 points….literally overnight. My son got one several months ago. His went up 25 pts the day it came in the mail and has gone up 5 pts every month since. Janet Spencer with the door: personally, I thought you were one of the LEAST extreme preppers compared to “shoot the thumb off dad” and “the hiking condom chick”…and heh, a few others. You did a great job dealing with a recalcitrant spouse, and I hope your husband looks at things differently now. kathy, I found not a single thing crazy about your episode…you and your husband (if I’m remembering the episode correctly) are building a very cohesive community there…BUT…please tell the young fellow at the end there (who was helping with the apple cider) that he probably won’t be able to chat a roving band of hungry bikers into laying down the weapons that they will surely have and join your community. Having weapons doesn’t mean we as preppers want to go attack people…it means we want to be able to defend ourselves against all the trash out there. Who WILL have guns. By the time your young friend decides he may need to poison them (I know, he really didn’t mean that), he may not be able to do anything. And personally, I did get a lot out of your episode. You made me want to spread out my talents! If you’re on this board and have been on “Doomsday Preppers”, congratulations! It’s pretty cool being on a show seen all over the world. 😀 Glad to be able to talk to you! I think this show is propaganda. Its edited to make peppers look insane. I think it keeps people from pursuing the lifestyle BC they think everyone is crazy. But what happens if you aren’t prepared? You rely on the government- and I think that’s the point of the show. I live in south Mississippi (Greene County) and we are quite close to the Gulf of Mexico. My Mother taught me to make sure that I always had things put back for a hurricane. It may be 5 years or more between big ones, but they come. We were without power for almost a month after Katrina. Back then I had an electric stove, but did have a little camp stove that worked on gas. I was not nearly as prepared as I am now. I learned a hard lesson then! We have since moved to our long wanted farm house and are starting a farm. I have a gas stove and lots of manual cooking items such as a a non electric hand mixer and a manual can opener. I keep lots of stuff canned and bottled water. I panic if our propane tank gets close to 50%. Yep I learned my lesson! I am no doomsday prepper for sure, but I am more prepped than ever for another Katrina like event. You hit the nail on the head when you point out that drama is what sells. This is unfortunate, and disappointing, especially from what used to be an educational channel. Although we didn’t have a name for it, I realize that my mother and I have always been ‘preppers’. Ever since my mom got caught in Hurricane Camille, and experienced life under martial law, with a year old baby, and no family nearby. Add to that, we have mostly lived far out in the country. Before there was a convenience store at every corner, and grocery store on every street. We learned to have – at a minimum – the basic staples. Just as some people seem to be learning that debt can be very dangerous, perhaps people will slowly begin to realize that being prepared isn’t silly, or extreme. Keep educating, and being a prep ambassador. I agree that most of the depictions on “Doomsday Preppers” are of mentally challenged people or at least that is the way the show depicts them. Thus, I would NEVER describe myself to anyone as a “prepper.” Further, I can’t call myself a “survivalist” because that terms conjures up thoughts of people who quit their jobs, “bug out” to the woods, dig a hole to live in and eat bugs and squirrels. However, should supply side logistics, gas, water and power ever fail, we are equipped to weather the crisis with little to no upset in our normal living style. That said, we don’t label ourselves with any catchphrase to describe ourselves. My grandparents who raised me were farmers during the Great Depression and suffered not at all on their farm with cattle, hogs, chickens, goats, rabbits and a huge garden. THIS is the way we have molded our lifestyle and have only one niggling fear: lawless hungry hoards going from farm to farm and looting food, water and anything of value. Our only thoughts are that with this kind of lawlessness rampant in the area, there will be no legal repercussions for shooting looters as they enter our property. I emailed several preppers websites and the TV show creator about one true prep-worthy disaster coming in 2028 by my educated guess-analysis of the Bible book Revelation which says in chapter 16 there will be a great earthquake that causes all cities on earth to fall. That means all city infrastructure will be earthquake flat. So that is a definite time to be pre-stocked for 3.5 years with Wise foods and everything you’ll need to survive and pray the Gospel to prepare for ascension as Jesus returns. Nobody responded. The one real need for preppers they cop out on? It would be wise to start preparing spiritually for ascension or rapture now to make the first ascension in 2024 or the second in 2031. Pray a Gospel, Matthew, Mark, Luke, or John into memory so you can pray it always and live by it. Click on http://www.jesusgospelchurch.com to see my website and get more serious about Jesus than traditional churches are. Obey Rev. 18:4, leave the prostituted churches Paul was first Pope of. Start a real church, like Jesus did. I love your article. So many times any sort of prepping is seen in a negative light. I have lived in Alaska where there was one store and we were at the mercy of their pricing. We would run to Anchorage to buy supplies in bulk so that we could save money and still have enough on hand for the times when the roads ended up closed. Now I live in the lower 48 and have more access, but can break myself of the habit of taking advantage of sales and buying in bulk to save my family money. Preparing for a time when you may need those resources has helped us many times over our lives. Sometimes it has been having the food available to make it through a tough economic time, sometimes it has been having it available to help someone else going through a hard time, and sometimes it has been having enough to take care of the kids during a big storm so that they never felt like things were bad. Prepping isn’t about Doomsday situations, it is about preparing for the unknown and conserving your resources. Just came across it this evening, and agree with you wholeheartedly. I’m one of the hundreds of people that TLC has approached to be on their show, and no, I won’t do it, for many reasons you already mentioned. My thoughts are this…preparedness is a lifestyle, not a contest, to do list, or set of goals to shoot for. Either you learn how to deal with the obvious things in life proactively, or you spend the rest of your life dashing from one disaster to another. Keep up the great work. My parents were very little during the Depression. They were, of course, influenced by the measures their parents took to survive those times. I didn’t come along until the end of the 60’s, but grew up helping in the garden (in a suburb of Portland), and washing all the veggies before mom canned them. I believe part of the ‘stereotyping’ of stocking up on food has to do with the push, in the last few years, of “Eat fresh, eat local”—consuming produce from the area growers. It tends to make people only want to buy the freshest product. If you are walking to the community garden, or farmer’s market once a week, you only think in terms of “a few days”. To me, that doesn’t make sense, as I live in a climate not well suited for growing. We make jokes about “any snow after July 1st is the first snow for next season’. Now, we do have farmer’s markets here—but the vendors drive in from 2-300 miles!…..As for the show itself, I have seen some interesting ideas, but also wonder how some people haven’t had the BATF knocking on their doors, (say, the taxidermists who booby trapped stuffed animals?). I am going to keep on doing the things I do, prep-wise, because it doesn’t bother me what people think. I sleep better at night, and, the general “t.v. watching public” aren’t on my Christmas Card list anyway. This was just my two cents, whatever it is worth to everyone. After watching most of the “Doomsday Preppers” shows I’ve come away with more information on what not to do to prepare for an emergency. A heavy dose of common sense needs to be added to any TV show or article on this subject. Hey, they edited my words to say, “Our only purpose in life is preparing…” What I had said was, “I can understand how come people think this is our only purpose in life…” Huge difference. Yeah, they’re a bunch of schmucks. I’ve heard several other stories just like yours. The thing that always made me choke on my food watching this show (which I absolutely love, BTW) is the amount of time some of these people state they spend on prepping… 6 – 10 hours a day… WTH!? I spend about 6 – 10 hours a month and we have enough to last us several months. True, it helps that I live on lakeside property in the mountainous woods, but still, the statistics on that show are beyond ridiculous. A stock pile of food use to be called a pantry and now you’re a loon if you have one. Looking at my list; full pantry…check, firearms and ammo…check, lots-o-firewood (I live in a very cold climate and in a rural area) check, oil lamps with oil…check, first aid supplies…check, generator and a reasonable amount of fuel….check. If one were to just look at the list I believe some would consider me a ‘nut’ but if you lived where I do you would think twice about it. Losing power is a regular occurrence so to keep the house from freezing in the winter I have a wood stove, in the summer we just need the oil lamps. The generator is run when needed. My use of firearms range from hunting to self-defense. That said, I’ve helped more of my neighbors in times of crisis than FEMA. Life is too short to get caught with your pants down because you decided to conform to a ‘social norm’. totally agree! Hope for the best, prepare for the worst. For what it is worth, I just thought I would say that prepping (other than just keeping our finances in order) really wasn’t a part of our lives until I saw the Survival Mom on Nat Geo. So while it was certainly over the top, it did get me thinking. Maybe it got others thinking too? So maybe it wasn’t all bad. Sorry for the late post. Just doing some catching up…. The Discovery Network is to blame for their lowering of standards of what could have been long running and popular series. I thought that Discover was immune from the effects of Liberalism but obviously they are not. The shows producers deliberately chose to profile the fringe elements of our community in the name of ratings, and to add fuel to flame up the gun control elements of society. Its too bad, because the time the series ended, the prepping community was made to look like crazed animals, with guns and explosives, and nut jobs. This is not an error. They are following government guidelines making people who are smart look like idiots and criminals. The military has been given an outline of the characteristics of domestic terrorists which include being religious, pro-life, critical of government, and those who store weapons, ammunition and stockpile food and medical supplies.